Sherri Stout Boyle is the Founder and Chief Executive Officer of Birthday Direct Inc. that was started in 1995. Since then, the company has experienced tremendous growth and become one of the leading Internet retailers of birthday party supplies, party favors, and decorations. The company has received numerous accolades since its inception in 1996, including top awards for Best Customer Service Program from the National Party Retailing Association and notable press from Southern Living and Babytalk magazines. Birthday Direct ships thousands of internet orders each week and employs several graduates of UNA. Sherri is also the CEO of Moxzie Inc., an innovative designer and manufacturer of party supplies, accessories, and apparel. Based in Muscle Shoals, Alabama, the company is comprised of a collection of talented graphic designers, writers, photographers and product stylists. 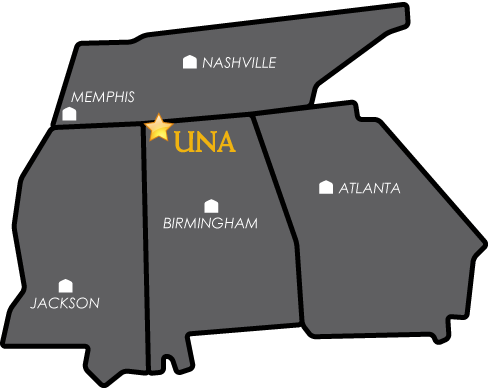 Many members of Moxzie's staff are also graduates from UNA. Sherri has served on the Board of Directors of the Better Business Bureau of the Shoals since 2009 and served as Chairperson on the Board of Directors of the Better Business Bureau of the Shoals in 2011. Sherri is originally from New Orleans, LA and attended UNA in 1994 – 1995. What guiding principles have kept your company ahead of the competition? Did you always know you would run your own company some day? I've always been observant and had a curious spirit. When I'm patronizing a restaurant, store or some other business, I really pay attention to the intricacy of how it is run. I can't help trying to figure out how to increase quality of the product, professionalism or productivity. How has your UNA experience contributed to the success of Birthday Direct? UNA gave me the tools I needed to become more professional and a leader of my company. Who were your mentors while attending UNA and how were those mentors inspiring or integral in shaping you as a person and as a professional? Dr. Kay Abbot offered me guidance and wisdom when I was at a crossroads with my rapidly expanding business. She encouraged me to apply the principles of academic learning to the challenges of running a business in the “real world".